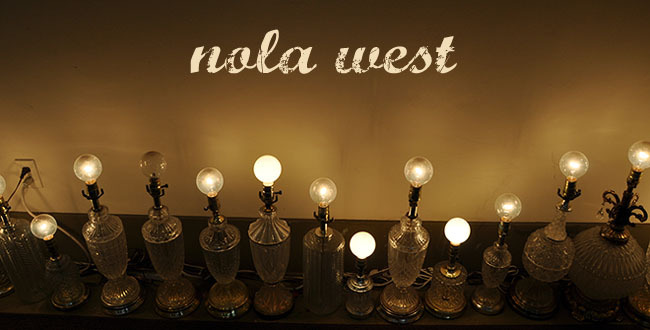 Nola West: You can see them at the Fest: Arcade Fire "Wilderness Downtown"
You can see them at the Fest: Arcade Fire "Wilderness Downtown"
I am sure that you all have seen this amazing Chrome Experiment using Arcade Fire's Wilderness Downtown. It's amazing. Technology never ceases to amaze me, just put in the address of a former residence and then you have a bespoke music video. In keeping with the Jazz Fest theme, I entered the old address of friends who lived across the street from the fairgrounds. Its poetic how still this part of town is in the google images and how lively it will be in April/May. For the full length video click: Our old Fest hangout! After last week's post, our friend Courtney suggested that the food line up needed a little love too. So we are adding a food pairing. 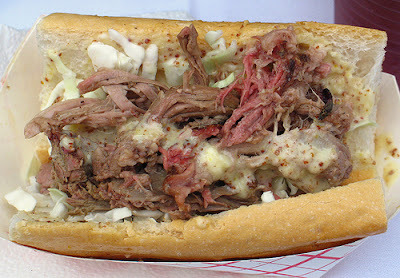 This week is the Cochon de Lait Poboy from Love at First Bite...not that it is wild boar but you get where I am going with this... Such a yummy blend of slaw, dijon, pulled pork, it is a MUST taste. I realize now that this food pairing series is going to get the best of me. All I can think of at this moment is how quickly I can get my rear over to BB's. Thanks for sharing! I love our new house & hood but sooo miss the old one as well, especially @ Jazz Fest! You might be propping up those preggo feet on that porch this year! I am looking forward to your future Jazz Fest music & food blogs! Courtney: as I am sitting here eating oatmeal, what I am really thinking about are BB's grillades and grits with a side of shoestring fries covered in gravy and cheese! Roquel: Let's hope my feet don't look preggo. I am so excited about the line-up this year that I don't want to miss a minute of it! That's amazing, Lauren! Thanks for filling tonight's dreams with Cochon de Lait Po'boy goodness. Bring it on. Je veux montrer mon admiration pour votre talent d'écriture et aussi la capacité de spectateur, tout lu à la fin. J'ai vraiment envie de lire la suite de vos blogs et de parler de mes opinions avec vous. Je serai votre visiteur fréquent, pour sûr. thanks for the great information about Wilderness Downtown it is really great, i enjoyed it. Keep it up.